You are here: Home > The Father’s Day Sale Is Over, But How Did It Go? 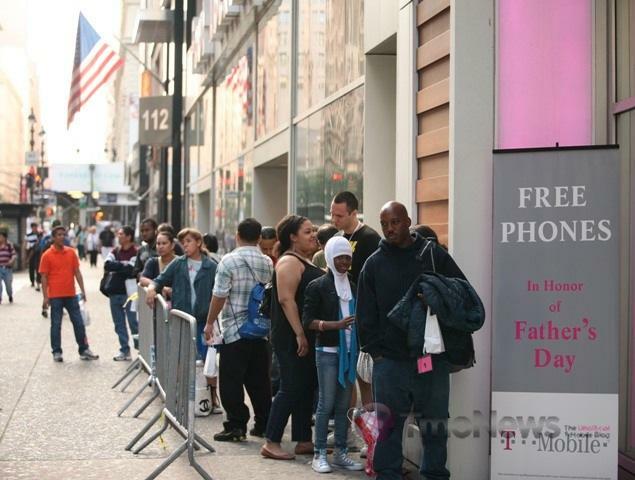 While its likely we won’t know for a few days how the T-Mobile One Day Fathers Day sale went numbers wise, judging by responses on Twitter and call center hold times, people were at the very least, inquiring. If Twitter responses are any indications, reps in T-Mobile owned retail stores should have themselves a fine little sales month. We’re hoping T-Mobile will release some sales numbers in the near future but we’ll be looking for our own info in the mean time. With the dust settled and the lengthy hold times hopefully yesterday’s memory, did you sign up for new service with T-Mobile? If so, welcome to the land of Magenta, where the water is clear and the sun is shining. True fanboy stuff right there huh? For the record, its Sunny outside and I’m going to the pool…that’s where I got the idea. It’s a silly day. CS said it was their busiest day ever. I had to wait 1 hr to talk to them. This promo set record numbers for tmobile in 1 day. For the retail channel we acquired 110K new customers 99k of them were postpaid customers. Looks like it was a success especially since goals were shattered by 11 AM! i work at t-mobile and it was ridiculous yesterday!!! we had about 8 times as much traffic than usual!! Please tell us that T-Mobile is getting the Galaxy S very soon. Being an employee you must know they need that kind of device. Today’s customers want the best, bring the best to T-Mobile. Being a long time customer I don’t want to leave to another Carrier to get a great phone. I actually talked to a sales rep on that day when I picked up MyTouch Slide for my bro. The rep didn’t have any idea if or when the Galaxy S was coming but she did indicate that the N1 would finally be in stores within a month or two. We talked about the Samsung Galaxy S too. He told me it is coming to T-Mobile next month. yeah it was our busiest day ever as well at our store we did more than double our quota and some stores did double of what we did. Maybe TMO had a lot of sales, but how many were coming from cancelled TMO contracts? How many will be cancelled w/ETF to sell the phone on ebay for a profit? the prices on ebay will drop with the volume of phones available. the free deal was better than buying one on ebay anyway. my current cliqXT was bought on ebay for 225$ and the reason i did it was i was trying a lot of phones out and i didn’t want to screw up my 2 full upgrades. right now the brand new cliqXT’s on ebay are not moving with a 250$ buy it now. my cliqXT will last me until something better appears then, i’ll use the BOGO and sign up for another 2 years. in case you haven’t noticed t-mo is the best there is. they got a new marketing head and he has to ‘make his bones’. culero guapo wtf is that hahaha ummmmmm tmobile makes money either way stupid, why not put stuff for free once a while. Dont tell me u like to pay for stuff and not want it free. What? Are you serious? what a crack head move. What sane person would ruin their credit for 7 years by doing that? Your statement does not make any sense at all. Lmao! Its actually true. Quite a few people risk their credit and/or they have fake id’s and open up lines and at the end of the day it ruins someone elses credit. i can vouch for what joe said, tmo retail channels alone did over 110K acts yesterday. my store alone did over 110 new adds ourself. the day was redic. i want to do it again!! black friday? open at midnight?! hmmm well see…. We had been contemplating switching from Sprint to T-Mobile because Sprint would not give us 4 lines. This was the perfect opportunity. Wife and the kids all got 3G Slides, I went with the Blackberry Bold 9700. We were with Sprint for a LONG time, 10 years, really disappointed that they would not give us 2 more lines… oh well. Wait was not too bad, but we got there when the doors opened. About 1 1/2 hours to pick phones, plan, and pay. Not bad. Figure some time in the middle of July i will get a PHAT check from TMO… X-mas in July! Yeah but people working there will have a fantastic paycheck which in turn will allow them to contribute to the economy. It’s trickle up economics. Any little bit helps. EM+ Contracts Were Eligable At My Location…. the backdoor upside is, re-stocking with newer/better hardware. this could be the small step that makes a UMA/ANDROID that much closer. Completely agree with Kershon’s first sentence. Sorry typo I mean 9pm. I’m sooooo glad this worked out for T-Mobile. Been with them a long time and need them to do well and stay around. The only worry I have is that given T-Mobiles track record, they’ll look at this and say “see, we don’t need high end phones. All we need is a good deal and they’ll come.” Which will mean those of us that want high end phones won’t see them from T-Mobile. i have a question do the employees make a commission on the plans or phones because i was wondering since the phones were free if the employees made some good money? I wasn’t able to get in on the free phones, but I did talk them into a much better price on the slide and got 4 of them for me and the family. That’s why I stick with Tmobile, because they will always do something to make the customer happy. I do hope to see some better phones come out in the near future though. MyTouchSlide, Bold 9700, HD2, and the Garmin are all really great phones. I am a sales rep and are store was crazy!! Are store had a goal to hit about 25 pspd acts and we did over 120 postpaid acts that of which I did 20 myself. I have never seen anything like that in any tmo store since I have worked for them. I’m sure it shattered many sales records for tmo. 99K as reported in an email from the higher ups. I went to get my girl a line on my family plan since she wanted the mytouch slide and the rep found a way to upgrade my line for free. He also found a way to get me discounts on my bill saving me almost $50 a month, and gave us both 1 month of free data. This is why I stick with T-mobile. I wouldn’t worry too much about the eBay thing. That is why there is the required MIR that can take several weeks to be mailed and only honored if the customer hits the 14-30 day buyer’s remorse mark. Dont forget the fact that tmobile stores have been riddled with fraud over the past year or so. I would like to see how many people will cancel or how many people committed fraud on this day. Either way congrats but like one poster said free has no value to the consumer its not the way to do business. 3. Something intended to deceive; deliberate trickery intended to gain an advantage. Someone taking financial advantage is NOT fraud. So please, give us some links documenting T-Mobile has been riddled with fraud by, for example, people targeting these free phone promotions. Fraud indeed. Yeah, that’s right, yesterday the stores were filled with con artists and fraudsters. And don’t forget the phone lines, I am sure they were clogged because of all the frauds calling to ply their crimes. Stores were indeed “riddled” with fraud. But at the end of the day of out of the 110k post paid customers only 100K were legit, than it was a job well done from t-mobile. I have to give props to the marketing department. And Bill… I have to wonder if your statements were influenced by your “profiling” those customers in the pic, the ones at the head of the line, e.g., you know a fraud when you see one. In any event, are you contending that the frauds you are talking about give T-Mobile fraudulent credit card numbers, addresses and social security numbers? If so, then T-Mobile needs to tighten its security procedures. And to assume that I am profiling the customers in the front of the line, I am guessing due to their color, is just asinine. I am Black. Leave race out of this. i love TMO! even though i didnt get a new phone im happy to see loyalty and new customers!!! and thats called commission fraud. they do it everywhere and tmo hasnt done much if anything to stop it. someone please explain this to “itsmichaelnotmike” as he seems to know the ins and outs of this business. I would say honestly that 110k number they got is realitically about 60k or less after they count all the accounts that were cancelled or will be cancelled. Either I was going to false churn with this or I was going to go to another carrier – it is ridiculous that as a 12 year customer that I didn’t qualify for this offer…not to mention we are now paying Tmobile $100 more a month. So take your pick – False Churn with increased RMR?? Or new Churn?? well first of all if you read the fine print it is for new activations. so the rep helped the customer that would have never been qualified get a new phone at the promotional rate. i would rather the rep do that then have the customer leave because they could not take advantage of the promotion. I understand you may see it as helping you but this is called false churn. Cancelling an account to reopen an account creates a negative business. It helps the consumer but the business cannot grow if this is done. Lets say for example all 110k activations were like that Tmo essentially gained nothing. So, yes, it is wrong. Total crap.. RSR’s coached customers who were out of contract to call in and cancel… The dense ones even called in them self to cancel for them. (even though that is against policy) Customer loyalty was empowered to offer free phones (even those still in contracts) But that did little to fight off the churn. exactly. the funny thing is I am not speaking of only yesterday for commission fraud and people opening up soon to be cancelled accounts, this happens every single day. risk assesment closes more accounts than tmo opens. it is a serious problem that they keep away from the general consumer. it is easy to go in get a free phone cancel your acct and sell phone for profit. that is what some people are doing. or even better business accounts. i cannot count on my hands how many “businesses” would come in asking for 50 blackberrys just to let the lines run with no usage and the phones be sold for profit. Hey Michael why don’t you do us a favor and ask your friend at HTC what’s the deal with the HTC sidekick phone? I sure hope they can continue gaining customers on a regular basis. You can’t give away phones everyday, but TMO needs to do something to get out of their rut!